There are a lot of excellent films, books and journal articles in the public domain – both fiction and non-fiction – which refer to assisted dying. Following is a list of some of the ones you may find inspiring, educational or entertaining. There are many books, both fiction and non-fiction, that have been written about Voluntary Assisted Dying. Following is a list of some of the more significant ones published in recent years. Time to Die is essential reading for anyone following the Voluntary Assisted Dying (VAD) debate in Australia. 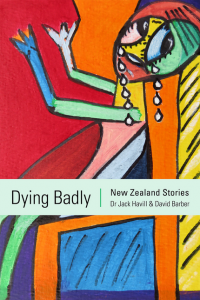 It brings readers up-to-date with the state of the VAD debate in Australia, with particular focus on the Victorian Parliamentary Inquiry into End-oflife Choices and the subsequent draft bill to legislate assisted dying. As in his previous book, A Good Death (2008), Dr Syme draws on his many years counselling dying patients. In some cases, as he has stated on national television, he personally enabled people to die at the time and place of their own choosing. Time to Die explores the notion of dignity in some detail, and discusses what we mean by ‘existential suffering’. Dr Syme makes a persuasive case that any legislative framework for assisted dying in Australia should cover not only the terminally ill, but also those who are suffering from what he calls ‘advanced incurable illnesses’, such as Motor Neuron Disease. He argues for this in a compelling chapter, which analyses the notion of suffering, with reference to religiously-inspired ideals. 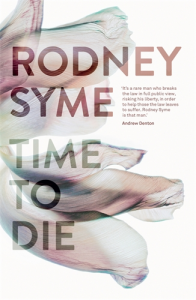 Time to Die by Dr Rodney Syme can be purchased directly from the Dying with Dignity Victoria website – click here for DWDV website – or from other leading online bookstores. The Damage Done contains 73 personal stories of Australians who suffered (or are still suffering) as a result of our current inadequate laws. These include the testimonies of sons, daughters, husbands, wives, partners, and friends, as well as the dying themselves. Their accounts detail trauma and suffering on a staggering scale. 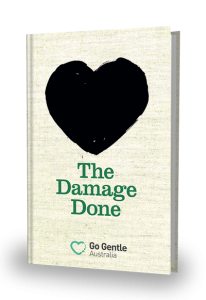 The Damage Done is available from the Go Gentle Australia web shop for $20 plus postage or you can download the eBook for $15. To visit the Go Gentle web shop, click here. 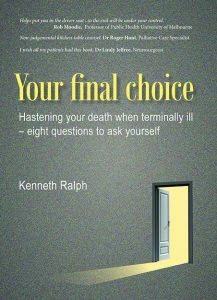 Your Final Choice: Hastening your death when terminally ill – eight questions to ask yourself By Kenneth Ralph a superb introduction to the topic of voluntary assisted dying and end-of-life choices for people new to thinking about these issues, as well as a great starting point for anyone contemplating making an Advance Care Directive. Kenneth Ralph runs a private counselling service in Geelong and is trained in philosophy, theology and psychotherapy. 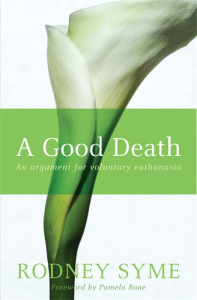 In this book he calmly and rationally lays out the arguments for and against voluntary assisted dying in a highly sensitive and readable manner. He draws on a wide range of sources including medical research, psychology, philosophy, theology and legal research as well as a number of case studies from his own experience and elsewhere. A unique aspect of the book is that the author, Kenneth Ralph, is a person of faith (Christian) who argues cogently for the consistency of religious belief and a belief in assisted dying. Though he declares his own support for medically assisted death from the outset, he gives due consideration to opposing positions. The bulk of Your Final Choice: Hastening your death when terminally ill – eight questions to ask yourself is geared to helping you build your own case about which of the various hastening options you prefer. Some of the important questions the reader is encouraged to ask themselves include: which are the human qualities which would cause you to not to want to live if you lost them; how does your preference fit with your beliefs about a possible after life; and is there something to be gained by staying with the suffering. It is available online from Morning Star Publishing. To visit the Morning Star Publishing web shop, click here. 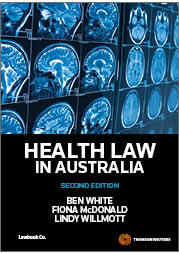 Health Law in Australia by White, Benjamin P., McDonald, Fiona, & Willmott, Lindy (Eds.) (2014) [Second Edition] is Australia’s leading text in this area and was the first book to deal with health law on a comprehensive national basis. In this important field that continues to give rise to challenges for society, the book takes a logical, structured approach to explain the breadth of this area of law across all Australian jurisdictions. By covering all the major areas in this diverse field, Health Law in Australia enhances the understanding of the discipline as a whole. 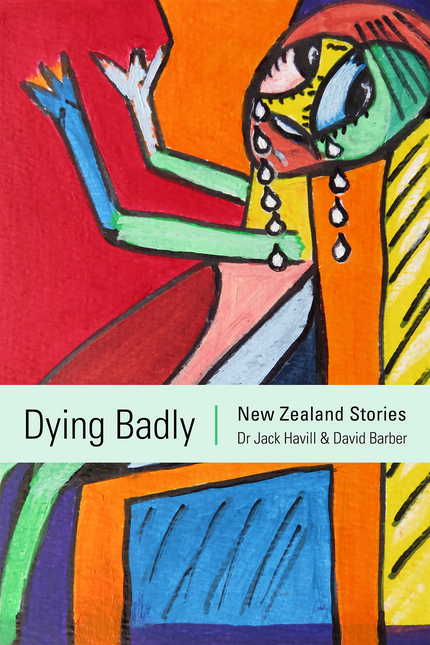 The book includes discussion of beginning-of-life and end-of-life issues, with a chapter by Cameron Stewart on voluntary euthanasia and assisted dying. Health Law in Australia has been written for both legal and health audiences. It is essential reading for undergraduate and postgraduate students, researchers and scholars in the disciplines of law, health and medicine, as well as health and legal practitioners, private health providers, and government departments and bodies in the health area. The contributing authors are national leaders who are specialists in these areas of health law and who can share with readers the results of their research. or borrow from University Technology Sydney library 347.446 WHIE (ED 2). 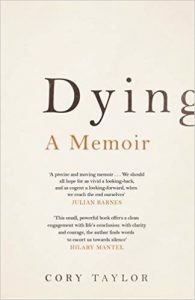 Cory Taylor wrote this remarkable book, Dying: A Memoir, in the space of a few weeks before her death from melanoma-related cancer in July 2016. In a tremendous creative surge, as her body weakened, she described the experience of knowing she would soon die. Her powerful and beautifully written book is a clear-eyed account of the tangle of her feelings, her reflections on her life, her memories of the lives and deaths of her parents. She tells us why it was important to her to have the ability to choose the circumstances of her death. She even got as far as ordering a euthanasia drug from China. But though the knowledge that she could end it herself was important to her, she couldn’t actually do it. In the absence of a supportive legal system, she would have had to take the drug alone, and she worried about the impact on her loved ones and the people who found her. She didn’t want the word “suicide”, with its connotations of mental turmoil and despair, on her death certificate. Cory made facing death her project; and came to find it fascinating. She hoped her final work, Dying: A Memoir, would trigger more open and honest conversations about how we die. After by author and columnist (News Limited), Nikki Gemmell, is a reflection on the suicide of her mother, Elayn, who died alone in her home, consumed alcohol with the drug ‘Nembutal’. Elayn had been suffering unbearable pain and disability. Leading to an addiction to pain-killers. 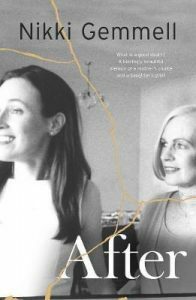 The book is enriched by the inclusion of a large number of the personal letters of suffering that Nikki Gemmell received after she wrote about her mother’s death in her column in The Australian. After is published by Random House. For nearly four decades, Derek Humphry has blazed a trail for the right to die movement. He founded the Hemlock Society, pioneered Oregon’s Death with Dignity Act, and wrote the bestselling book Final Exit : The Practicalities of Self-Deliverance and Assisted Suicide for the Dying (1991). Humphry also wrote Jean’s Way (1978) about his beloved wife, Jean, who was diagnosed with cancer. This international bestseller is a moving account of Jean’s carefully planned self-deliverance from suffering. It is the story of the author’s terminally ill wife of 42 years, who asked him to help end her life to avoid further suffering in the final stages. The right-to-die aspect of this book launched him into an unexpected career of spokesperson for the burgeoning movement. 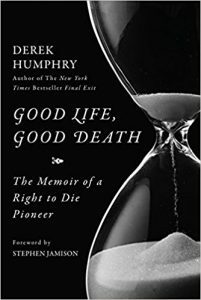 Good Life, Good Death: The Memoir of a Right to Die Pioneer is Humphry’s poignant memoir, reveals the personal pain and emotional distress they endured, as well as the legal repercussions Derek faced following his wife’s death. To know why he has maintained this struggle for choice in dying, against powerful religious and political forces it is necessary to understand the whole man. Readers will appreciate the fight he has gone through so that others might consider the option of dying with dignity. In 2015 Matt Vickers supported his wife, Lecretia Seales, in her campaign to gain the right to choose how she died. 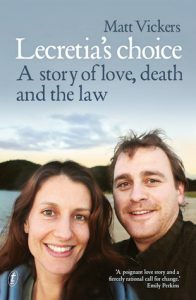 In his first book, Lecretia’s Choice: A Story of Love, Death and the Law, Matt tells the story of their life together, and how it changed when his proud, fiercely independent wife was diagnosed with a brain tumour and forced to confront her own mortality. The death she faced—slow, painful, dependent—was completely at odds with how she had lived her life. Lecretia wanted to die with dignity, to be able to say goodbye well, and not to suffer unnecessarily—but the law denied her that choice. With her characteristic spirit, Lecretia decided to mount a challenge in New Zealand’s High Court, but as the battle raged, her strength faded. Lecretia’s Choice: A Story of Love, Death and the Law is not only a moving love story but compulsory reading for everyone who cares about the dignity we afford terminally ill people who want to die on their own terms. It is published by Text Publishing. In his bestselling books, Atul Gawande, a practicing surgeon, has fearlessly revealed the struggles of his profession. 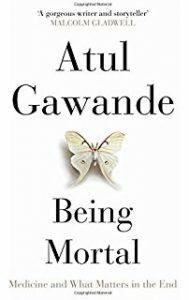 Now in Being Mortal: Aging, Illness, Medicine and What Matters in the End he examines its ultimate limitations and failures – in his own practices as well as others’ – as life draws to a close. And he discovers how we can do better. He follows a hospice nurse on her rounds, a geriatrician in his clinic, and reformers turning nursing homes upside down. He finds people who show us how to have the hard conversations and how to ensure we never sacrifice what people really care about. Through eye-opening research and gripping stories of his own patients and family, Gawande reveals the suffering that modern medicine has produced. Nursing homes, devoted above all to safety, battle with residents over the food they are allowed to eat and the choices they are allowed to make. Doctors, uncomfortable discussing patients’ anxieties about death, fall back on false hopes and treatments that are actually shortening lives instead of improving them. And families go along with all of it. Riveting, honest, and humane, Being Mortal: Aging, Illness, Medicine and What Matters in the End shows that the ultimate goal is not a good death but a good life – all the way to the very end. Being Mortal: Aging, Illness, Medicine and What Matters in the End is available as a book and a CD-audio. Death by Choice Versus Religious Dogma is a call to action by the silent majority against the vocal religious ultra-conservative minority that is dictating its non-secular ideology on everyone else. Hani Montan’s latest demands to be heard-and requires that the majority seize control of their lives by controlling the ways and means of their deaths. 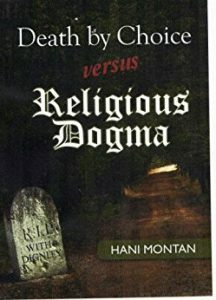 A deeply thoughtful, expansive view on the rights of the dying, Death by Choice versus Religious Dogma is a book for everyone who is facing lingering death now and those who will be in similar predicament later. Containing many unique features, Montan’s treatise gives such useful information as: samples to assist the readers in the preparation of their own legally binding “Advance Health Directive” which is now acceptable in many Western countries. A Good Death is Dr Rodney Syme’s candid and provocative account of the experiences of many terminally ill people he has assisted to end their lives. The full transcript of a presentation by Dr Syme to Dying with Dignity NSW (known as the Voluntary Euthanasia Society of NSW at that time) was published in the March 2009 Newsletter of Dying with Dignity NSW. Amongst many things it said: “… the book [A Good Death] had its genesis in around the year 2000 when I realised that I had had quite a significant experience in assisting people at the end of their lives. That experience had taken place in a covert environment for over 25 years – and it was an experience not unique to me but, one which few, if any doctors, were prepared to talk about – and I felt that the journey that I’d had could be worth talking about. At the same time I knew that I was exposing myself and my activities which were perhaps quasi-legal, to say the least, to public scrutiny, which is why the book took such a long time to come to fruition. Every time I sat in front of my computer I said: Am I being an absolute idiot? The Peaceful Pill Handbook is the leading self-help guide to end of life planning for Seniors and folk who are seriously ill. The Handbook provides detailed discussion and analysis of strategies in lay language which everyone can understand. Topics covered include: the old fashioned barbiturates, gases, prescription drugs, poisons and the three Swiss assisted dying services available to foreigners. 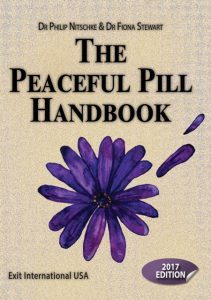 The Peaceful Pill Handbook was originally published in the U.S. in 2006, but has had many updates since then. It is written by Australians, Dr Philip Nitschke and his wife, Dr Fiona Stewart, founders of Exit International. While the book was initially granted an 18+ rating in Australia, in early 2007 the publication was refused classification (RC) by the Classification Board. In 2008 the on-line handbook was launched. The Peaceful Pill Handbook and The Peaceful Pill eHandbook are sold from the Exit International website store. NB: Dying with Dignity NSW does not encourage anybody to end his or her life, does not provide information on self-deliverance, does not provide people with equipment or medication that could be used to end lives, and does not help anyone end his or her life. As an organisation, Dying with Dignity NSW is neutral (in that it neither supports nor opposes) Exit International’s policy on self-deliverance, but we defend the right of Dr Nitschke and members of his organisation to speak publicly about end of life planning. 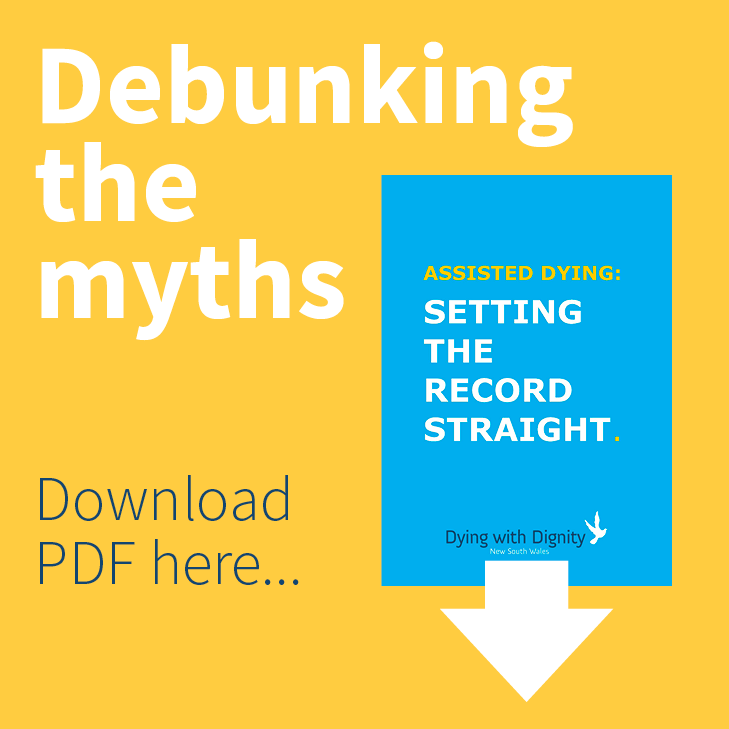 There are an increasing number of podcasts being made which deal with Voluntary Assisted Dying. Please let us know of any good ones you would recommend that we add to this list. As the product of his extensive research, in Australia and in overseas jurisdictions which have legalised assisted dying, Andrew Denton and The Wheeler Centre created a 17-part podcast series called “Better Off Dead”, which explores the issues surrounding voluntary assisted dying in Australia and beyond. Click on the episode name to listen to the episode or click the link at the end of the description to read the transcript of that episode. Please note: The content of this podcast and some of the articles written by Andrew Denton may be upsetting to those who do not like to recall their own experiences of suffering or watching those they care about suffer towards the end of their life. Denton’s podcast is not about suicide. There are an increasing number of films, both fictional and documentary, dealing with the issue of Voluntary Assisted Dying. Following is a listy of some of the more notable examples. Please let us know of any other good ones you would recommend that we add to this list. 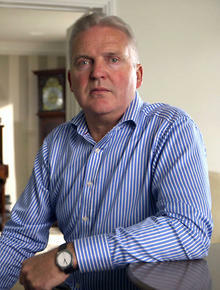 Filmed and directed by award-winning filmmaker Rowan Deacon, and made in partnership with the Open University, How to Die: Simon’s Choice is an intimate and deeply moving film follows Simon and his family and friends as they grapple with the huge moral, emotional and legal dilemmas around Simon’s choice. Their conflicting perspectives unearth difficult questions for Simon which mean that his heart-wrenching decision is hanging in the balance until the very end. Shot against the backdrop of the recent parliamentary debate on the assisted dying bill, How to Die: Simon’s Choice explores the complex human questions at the heart of this deeply divisive issue. 1 hr 25 mins documentary. 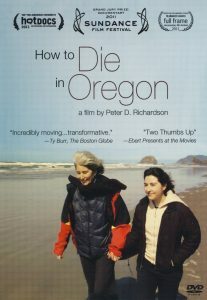 How to Die in Oregon is a documentary which explores real life responses to Oregon’s “Death with Dignity Act,” the first law in the U.S. to allow physicians to prescribe lethal doses of drugs to the terminally ill.
How to Die in Oregon examines both sides of this complex, emotionally charged issue. Richardson features interviews with journalists, lawyers and physicians as they talk about the efforts to legalize physician-assisted suicide. What emerges is a complex, poignant, and deeply moving portrait of what it means to die at the time and circumstance of one’s choosing. 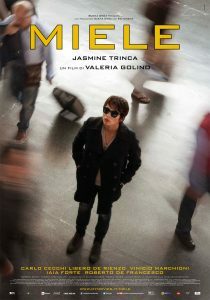 Winner of the 2011 Sundance Film Festival U.S. Documentary Grand Jury Award. On Michelle Flowers’ 35th birthday she received a bundle of letters from her younger sister Angelique. The letters expressed Angelique’s love of nature, art and literature, and most of all her unique and joyful personality, despite suffering from a painful disease since her mid-teens. A year on, she’s in the last phases of terminal illness, and is struggling to find a peaceful way to die. Janine Hosking’s innovative and moving film follows Angelique’s final months as she struggles to find grace in an inflexible health care system. 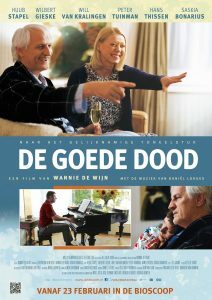 A Good Death is based on Wannie de Wijn’s successful 2008 stage play about a group of relatives gathering to say goodbye to a terminally ill member. Bernhard has late-stage lung cancer and has decided to end his suffering with the help of his friend and doctor, Robert. The end is planned for 9 on a Saturday morning. It is now 18 hours prior to that deadline, and Bernhard’s family arrives at the house to discover, to their dismay, his plan to end his life. Only Bernhard is at peace with his decision. Each family member registers a slightly different reaction to the impending event. A Good Death is an emotional and thought provoking film that looks into euthanasia and the consequences on the dying and the living. 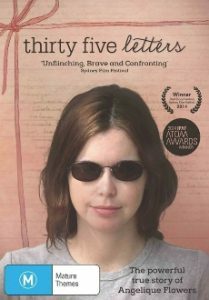 This film explores both sides of the argument relating to euthanasia, in a human and intelligent way. 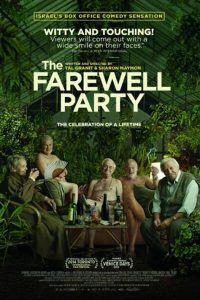 The Farewell Party is a unique, compassionate and unlikely funny story of a group of friends at an upmarket modern Jerusalem retirement home who decide to help their terminally ill friend. One of their number devises and builds an assisted suicide machine that enables a close friend, dying in pain, to put an end to his life. Word of their achievement spreads, however, and people come seeking their help, putting them under considerable pressure. Differences and complications emerge. The Farewell Party makes its points strongly, but it is not a simplistic or didactic movie: it is empathetic work that doesn’t shy away from the ethical and emotional complexities of its subject matter. Obviously, this is tricky stuff, but directors Sharon Maymon and Tal Granit, both in their 40s, manage to mix morbidly amusing jokes with a wry appreciation for the seriousness of the subject matter. They are aided immeasurably by their veteran cast’s moving, young-at-heart performances. Old people used to die at home, surrounded by their loved ones. Now they are ending up in intensive care, connected to machines and surrounded by strangers. Intensive Care specialist Dr Charlie Corke is committed to give his elderly patients every chance to get better, but he knows that sometimes the treatment is only lengthening the dying process, causing discomfort and distress. In The End takes us on a journey of a doctor who is trying to balance his own enthusiasm for life-prolonging technologies with an acceptance that, after a long and healthy life, it’s OK to go. At his own hospital Charlie conducted a ground-breaking study that discovered that, overwhelmingly, families opt for medical intervention even though they believe that the treatment is inappropriate, even when they are aware the treatment is contrary to their parents’ wishes Understanding that doctors – particularly junior doctors – regularly offer their patients technological intervention which may be futile, Charlie developed the training program “When Enough is Enough”, which aims to improve doctors’ end-of-life communication. Last Cab to Darwin received positive reviews from critics and audiences. It has heart and humour and a sense of history about black-white relations. Last Cab to Darwin was modelled on the true story of Max Bell, a taxi driver from Broken Hill who made the 3000 kilometre trip from Broken Hill to Darwin in 1996 seeking euthanasia. Like Rex in the film, Bell also drove back to Broken Hill, but Bell did so reluctantly. He had been unable to obtain the signatures required to proceed with euthanasia in Darwin and died slowly in hospital in Broken Hill, the fate he was trying to avoid. 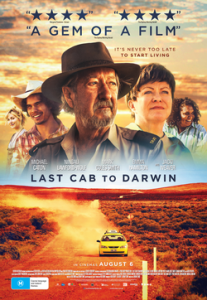 Last Cab to Darwin cannot be described as a film promoting the campaign for the legalisation of voluntary assisted dying in Australia. Dr. Death takes the form of an attractive young woman in Honey (Miele in Italian), an impressively mature directing debut from Italian actress Valeria Golino, who crafts an often engrossing character study around an assisted suicide activist. Honey is the code name for Irene, a fiercely free­-spirited woman in the shadowy business of assisted suicide. Portrayed by Jasmine Trinca, an athletic gamin with adorably crooked teeth, Irene is connected to a loose network of contacts who direct her to terminally ill clients. They pay her handsomely in cash for what she views as ethically high minded missions of mercy to end their suffering. Once a month, she flies from Italy to Mexico, via Los Angeles, to purchase over­-the­-counter barbiturates used by veterinarians. Honey never evolves into a thudding, issue­ oriented debate about the right and wrong of euthanasia. Although Carlo’s world­ weariness touches on the kind of metaphysical malaise that has been a running theme in Italian movies since the 1960s, the film shies from directly addressing anguished existential questions. It is finally a story about the puncturing of one young, headstrong woman’s personal belief system. 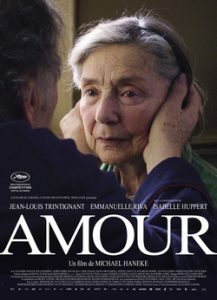 Amour was screened at the 2012 Cannes Film Festival, and it won the Academy Award for Best Foreign Language Film At the age of 85, Emmanuelle Riva, playing Anne, is the oldest nominee for Best Actress in a Leading Role. The starting point for Haneke’s reflections was the suicide of his 90-year-old aunt, who had raised him. According to Haneke, she was suffering under heavy rheumatism and lived the last years alone in her apartment, because she did not want to be placed in a nursing home. She had even asked the director unsuccessfully for euthanasia. This movie has complex moral layers that force viewers to consider very tough questions. The Sea Inside is a 2004 Spanish drama film written, produced, directed and scored by Alejandro Amenábar, which won the Academy Award for Best Foreign Language Film. 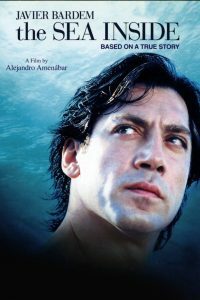 It is based on the real-life story of Ramón Sampedro (played by Javier Bardem), who was left quadriplegic after a diving accident, and his 28-year campaign in support of euthanasia and the right to end his life. The Sea Inside explores Ramón’s relationships with two women: Julia, a lawyer suffering from Cadasil syndrome, who supports his cause, and Rosa, a local woman who wants to convince him that life is worth living. The joys and frustrations of Ramon’s life are presented in beautiful intimate detail but really the film is a dialectic about the right of one person to end his life. The fact that Ramon Sampedro was a real living person gives this film additional power, not that it needs it with the stunning performance from Bardem. Denys Arcand’s sad and funny follow-up to his acclaimed The Decline of the American Empire (Le déclin de l’empire américain )(1986), did not begin as a sequel, but rather as an attempt to come to terms with mortality during the illness, and eventual death, of both his parents from cancer. Seventeen years after The Decline of the American Empire, the philandering Rémy is dying from cancer in a Montréal hospital. His ex-wife persuades their son, Sébastien, to leave his lucrative finance job in London and come to his father’s bedside. The tension between the arrogant capitalist Sébastien, who never forgave Rémy for his womanizing ways, and his “sensual socialist” father is palpable. Despite his antipathy towards his father, Sébastien uses his money and influence to secure Rémy a private room on an abandoned floor of the hospital and strikes a deal to provide Rémy with heroin to alleviate his pain. Surrounded by his friends at the cottage they loved so much in their youth, during their touching farewell, Rémy receives the fatal dose. The Barbarian Invasions drew largely positive reviews following its screenings at the Cannes Film Festival and became the most successful Québec movie ever in France. It became the first Canadian feature film to win an Academy Award and the César Award (French Oscars) for Best Film. There are many journal articles and opinion pieces written about Voluntary Assisted Dying. Please see our FAQs and Related Groups web pages for other references.